There is nothing better than a modern and trendy home with clean lines and a chic design. This is why we are so excited to take you to Germany today, where design professionals Die Hausmanufaktur have created a Scandinavian design that is as incredible inside as it is out. By employing a Scandinavian design, the result is a home that marries comfort with style. 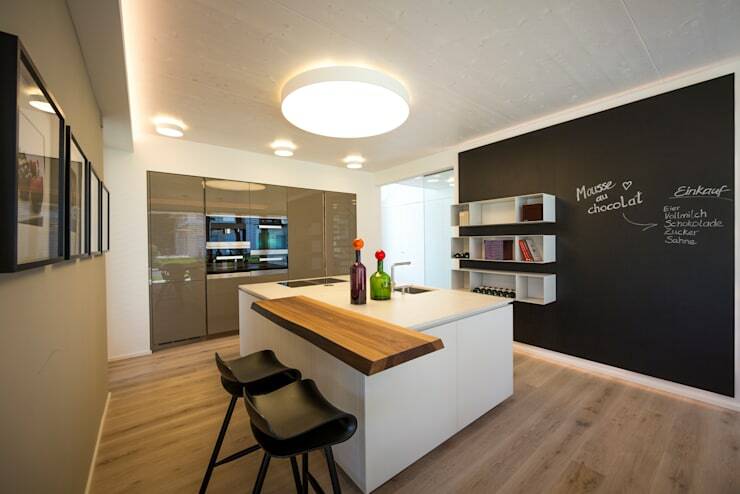 Characterized by simplicity, minimalism and function, the house oozes finesse. By going from room to room, we will also see how we can deploy Scandinavian designs in our own homes, creating an effortlessly stylish home. From the outside, we can see just how incredibly sleek and modern this home is. With a simple white facade and an abundance of glass, the home interchanges with the interior and exterior spaces flawlessly. The glass also allows sunlight to filter into this home, creating a very light and airy look and feel. We can see how the home extends over two levels, with the different sections of the home layered upon one another to create a very dramatic shape. 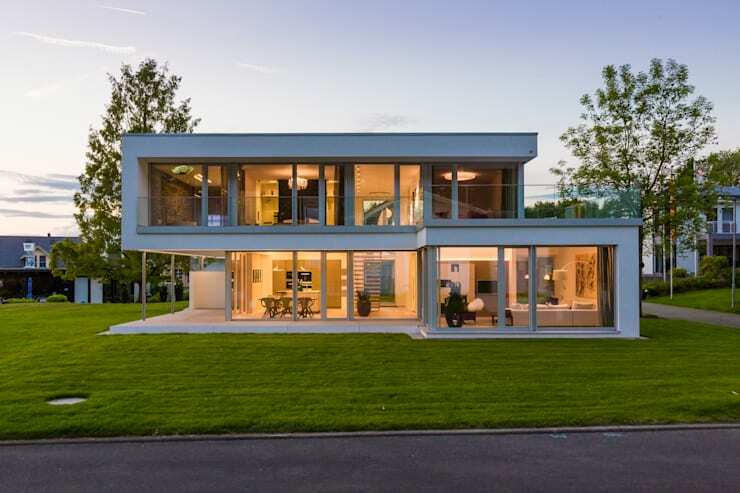 The very modern home also contrasts beautifully with the lush green grass. 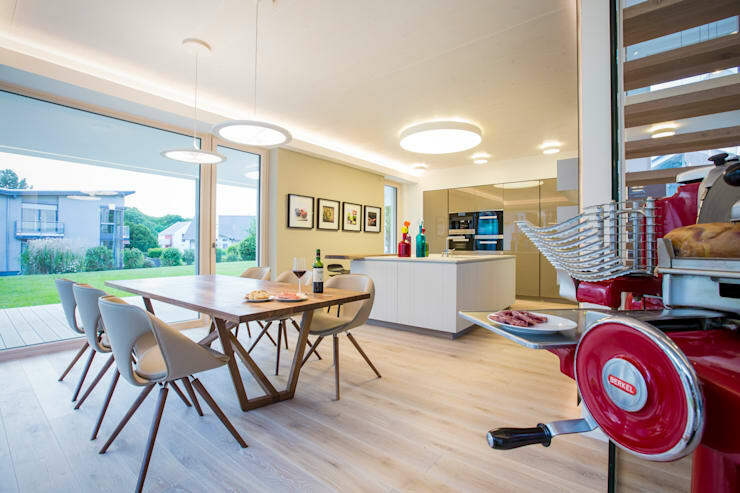 As we enter the home, we can see that the designers have opted for an open plan design where the kitchen and the dining room spill into one another. A neutral colour palette has been chosen for the interior space, creating a warm, earthy and soft look and feel. A touch of colour has been added in the form of some of the appliances, bringing a subtle splash of life and vibrancy. The pieces of artwork on the walls have been very carefully chosen, ensuring that this house becomes more than just four walls. The design of this space is perfect for the family, allowing for constant interaction. Mom and dad can keep an eye on the kids from the kitchen while they eat their dinner or friends can gather around the kitchen island over a glass of wine while the chef whips up a feast. If we look in the corner of the kitchen, we can see that a blank wall has been painted black, creating a chalk board in the kitchen. This really brings some personality and charm to the home. The giant chalkboard can be used for writing up recipes, quotes, messages to other members of the family or even shopping lists! This allows the whole family to participate in the artwork of the kitchen. Have a look at these other tips for utilizing that empty kitchen wall. 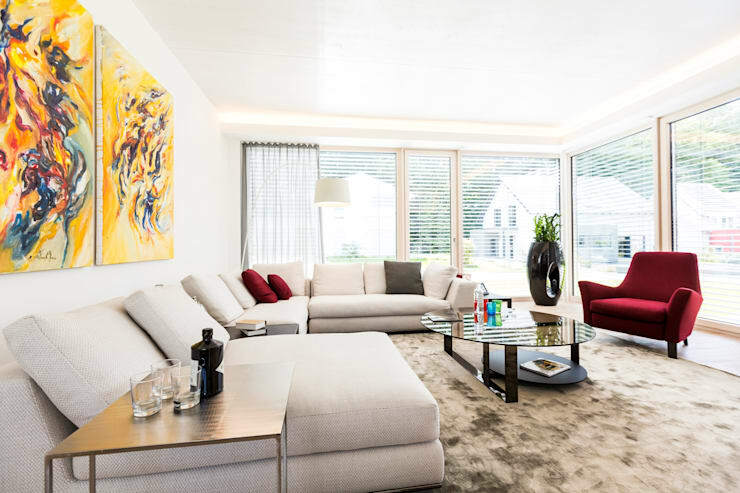 The living room features an expansive L-shaped sofa, which provides plenty space for the family to cozy up and read their books or watch a film. The cushy rug adds to the comfort and coziness of the environment. The designers have used a neutral colour palette for the base of the room, while adding splashes of color here and there in the form of the cushions and the incredibly vibrant artwork. A pot plant has been added to the corner of the living room, bringing a very natural and fresh form of decor to the room. This is a great tip for any home! The bedroom is one of the more luxurious rooms in the house, thanks to the plush facade above the bed, which looks like an extension from the headboard and the very intricate and lavish chandelier that hangs from the ceiling. Your bedroom should feel like a haven or a cocoon where you can relax and escape from the rest of the world. This is why it should feature some high quality linen as well as some details that will make this space feel like your own home spa. Don't be afraid to add some items that will also exude your personality and style. The wooden wall and wooden floor also envelopes this space, creating a very warm environment. Have a look at these tips on how to make your bedroom more romantic. In order to achieve a minimalist and functional home, you need to invest in storage space where all of your personal items can be stored neatly out of sight. Invest in cupboards, shelves and drawers that hide anything that isn't functional or necessary. Keep them neat and organized for a design-savvy home! Have a look at these 12 clever ideas for storage. The bathroom is the star of the home and it's where we end off our tour today. 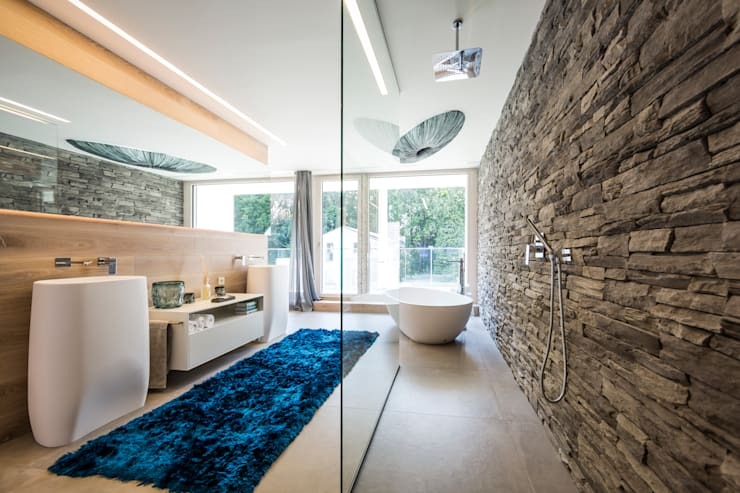 The stone facade that runs along the entire length of the bathroom wall integrates the interior with the exterior, bringing an earthy look and feel to the space. It's very dramatic, chic and stylish. The long blue rug that runs along the entire length of the bathroom brings a cozy feel to the space, as well as a touch of color. The bathroom also features large glass windows and doors, which allows natural light to spill into the room. Wouldn't you want to spend all day in the tub?